AUSTIN, Texas - The Texas Historical Commission (THC) has recognized the Lipscomb County Historical Commission (CHC) with a distinguished Service Award for the 2015 year of service. The THC issues Distinguished Service Awards each year to CHCs that document well-rounded programs of history and preservation related projects. The award was presented during the work day of the commission on July 13. to commend the CHC's dedicated service and stewardship of Texas' unique cultural and historical sites. "County Historical Commissions are the backbone of historic preservation and education in communities across Texas," said THC Executive Director Mark Wolfe. 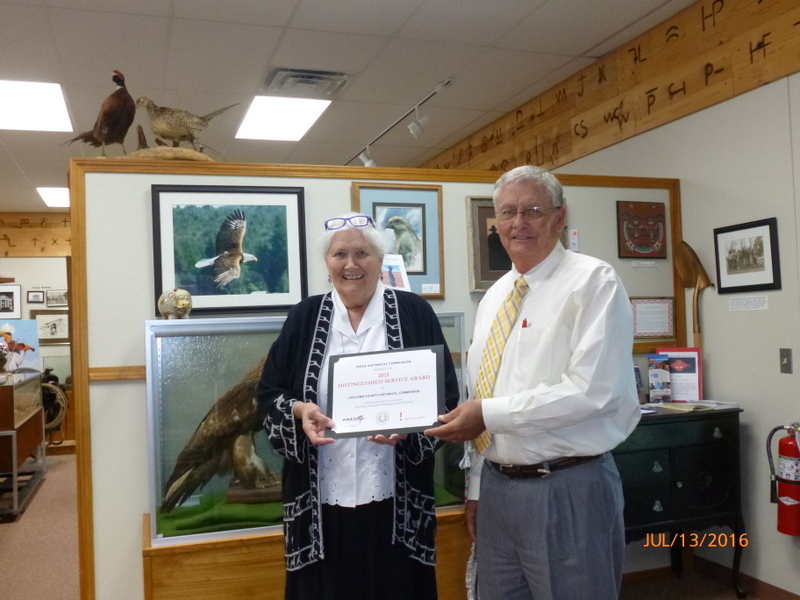 "The Texas Historical Commission is proud to recognize the exceptional efforts of the Lipscomb County Historical Commission in appreciation of it high level of performance during 2015." Texas CHCs provided more than 480,000 volunteer hours in 2015, which is an in -kind donation to the state valued at $11.3 million. The THC assists CHCs statewide through programs and services that preserve Texas' heritage for the education, enjoyment, and economic benefit of present and future generations. The THC's advisory role to CHCs is outlined in the Texas Local Government Code, the statute that enables county commissioners courts to establish CHCs. The volunteer appointees, as directed by county officials, initiate an conduct programs that preserve the historic and cultural resources of Texas. For more information about CHCs in Texas visit thc.state.tx.us/chcoutreach or contact the History Programs Division at 512-463-5853. The Lipscomb County Historical Commission is located at the Wolf Creek Heritage Museum, Lipscomb, Tx, Email: wolfcrk@amaonline.com, Phone: 806-652-2123.